Recently, we found ourselves home on a Saturday night with no plans. How did that happen? We decided to use the time to do something we used to love doing, but haven’t had time to do in ages – cook a (somewhat time intensive) dinner together. I was too lazy to go to the store, so we saw what we had in the house and went from there. It was a little on the chilly side, so we focused on fall foods and decided to make chicken pot pie. I looked at a bunch of different recipes, but ultimately, we sort of winged it and made up our own. Preheat the oven to 375 degrees. Place one of the pie crusts in a pie pan and brush it with egg wash. Once the oven is up to temperature, bake the pie crust for only 5 minutes. Remove the pan and let it cool on the counter. Chop the carrots, celery stalk, and red pepper. Put those veggies in a pan with high sides. Add the chicken stock, chicken, peas, corn, and some celery salt to the pan. You want to make sure the ingredients are mostly covered in the chicken stock. Allow the pan to come to a boil, then let it simmer for 15 minutes. While the veggies and chicken are cooking, start making the onion and flour mixture. Melt the butter in another pan and add the onion. Cook until the onion is translucent. Then, add the flour, milk, and salt and pepper to taste. The mixture should thicken up a bit. 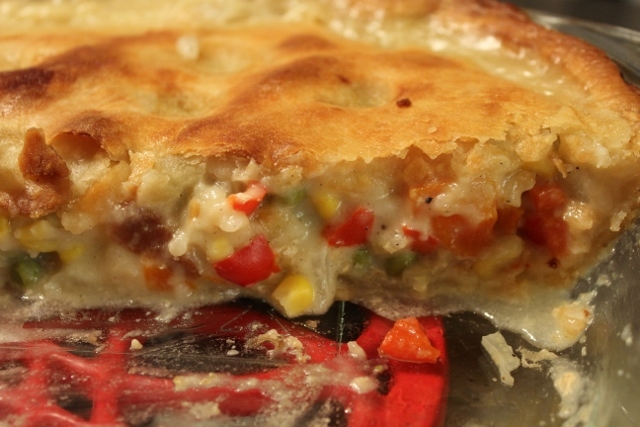 Once both parts of the pie and cooked, add the flour-onion mixture to the veggie-chicken mixture and stir. Once combined, spoon about half of it into the pie pan. Smooth the surface as best you can. Then, add the other pie crust to the top. Try to crimp the two pie crusts together, so nothing boils out of the pie. 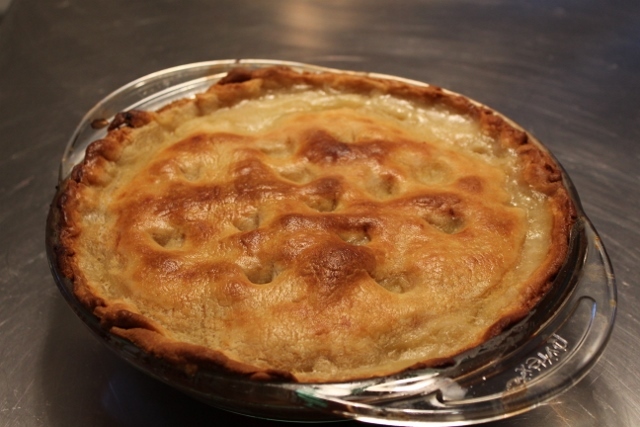 use a sharp knife and poke some venting holes on the top of the pie. Finally, brush on more of the egg wash.
Let the pie bake for about 30-35 minutes. When fully cooked, let the pie sit for a bit, maybe 10 minutes or so, before cutting. This pie was so tasty. One quick comment – be a little heavy handed with the spices. Ours could have used more celery salt, or even some poultry seasoning. The pie was a little on the bland side, so next time, I’ll be sure to give it some kick.